MA-164. Massachusetts. August 18, 1775. 7 Shillings & 6 Pence. PCGS Currency Choice About New 58.No. 110. Signed by Wheeler and Plympton. Printed on thick paper. Text, titles and dates enclosed within three engraved scroll flourishes, serial number at top center. Sailing vessel docked within small vignette at bottom left. Revere engraved back with patriot holding a sword in his right hand and a scroll with MAGNA CHARTA in his left. Motto above "Issued in defence of American Liberty." Below the Latin motto "Ense petit placidam, sub Libertate, Quietem." (By arms he seeks peace with freedom). The denomination is written above while the issue date is below. 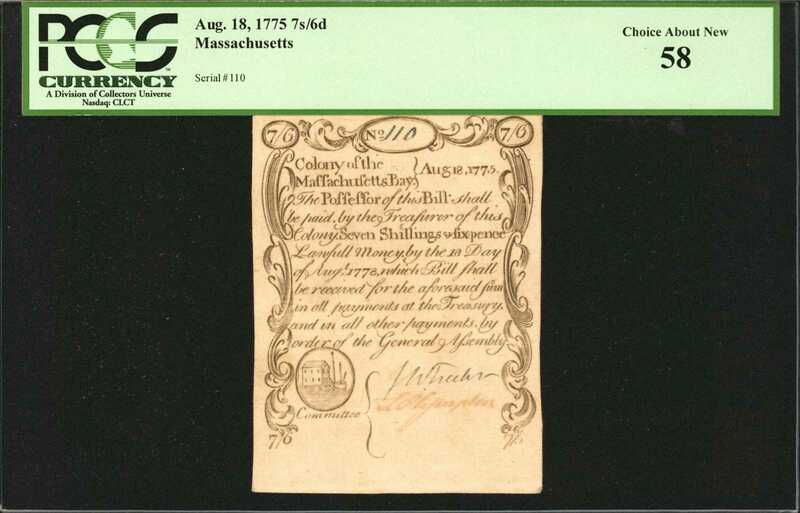 <p>This "Sword in Hand" note comes from the August 18, 1775 emission for which 10,000 notes were issued for each denomination. An incredibly well preserved and sharply printed note appearing as it could have just recently left Reveres print shop. Three large margins are noticed on the face while the back design is centered nicely in the middle of the note. Just a light corner tip fold is seen in the top right corner. An old collectors annotation is found in the back bottom left corner. The signatures are neatly penned in differing inks. Reveres famous "Sword in Hand" motif is impeccably detailed. One of the few high grade examples from this series we have ever had the privilege to offer and a note worthy of a lofty bid.From the John Whitney Walter Collection. Ex: Stacks Samuel J. Berngard Collection Sale, July 27-28, 2008, Lot 3574.